APC News Alert - Former Akwa Ibom State First Lady and wife of Senate Minority Leader, Ekaette Uloma. Akpabio is brain dead resulting from critical health condition, this paper can authoritatively report. Almost all her vital organs have failed, a medical condition doctors classify as Uremia has set in with the patient suffering from mental disorientation. As a result, a major crisis is brewing between the former Akwa Ibom State Governor and current Senate Minority Leader, Senator Godswill Akpabio and his in-laws. “Eka Esit Mbom” or “Mother Theresa” as the former first lady was fondly called by her supporters and loyalists when her husband was Governor of the oil-rich Niger Delta State has been critically ill for months before being in a state of coma two months ago. Sources close to the family told our reporter that her health condition worsened suddenly as the EFCC and Code of Conduct Bureau started investigating billions of naira traced to her bank accounts as well as a multi million Pope John Paul International Nursery School in Uyo which she owns but she was unable to explain to the anti-graft agency where and how she got the money to build the school. The probe allegedly triggered anxiety and apprehension which took its toll on her for months before her health condition nosedived. Her health allegedly deteriorated over the weekend with the failure of her kidney and liver, a situation that has left the former first lady non reactive to treatment thus not conscious of herself or environment. When her family members visited her in the hospital, she was alleged not to have recognise any of them nor could she comprehend anything they said. Her mental disorientation is alleged to be synonymous to complete insanity. Rattled and dumbfounded by the sudden and drastic decline in the health of their daughter, Akpabio’s in-laws were alleged to have confronted the former Governor, accusing him of being the brain behind the ill health of their daughter. The In-laws accused the Senate Minority Leader of using his wife spiritually for sacrifice to acquire political power and relevance. Akpabio on his part was alleged to have flayed up at the accusation, insisting that as the spouse, he feels the pain and trauma of his wife’s illness more than the in-laws, denying ever using his wife for ritual purposes as alleged. 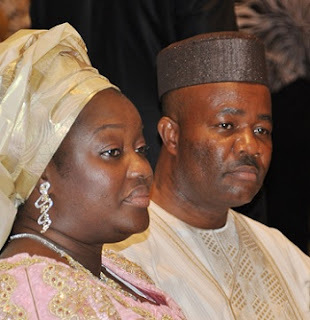 Unconfirmed reports say the in-laws threatened to take custody of the children for fear that Akpabio is also capable of using the children for rituals in view of his desperation to escape EFCC probe and prosecution for the over #2.5 trillion he is alleged to have stolen while he held sway as Governor of Akwa Ibom State from 2007-2015. He was said to have boasted before his wife took ill that he will do anything and go to any length to prevent being arrested by the EFCC or being sent to jail for corruption, a declaration that is fuelling suspicious among his in-laws that he might as well be ready to sacrifice his entire family if need be for political reasons. According to a source privy to the confrontation, the in-laws were worried that in just one year after leaving office, his wife’s health could plummet so sudden and at a rate that is unprecedented with all her vital organs collapsing. The in-laws allegedly found it strange that their daughter who was a year ago healthy and could afford medical checkup anywhere in the world could fall critically sick all of a sudden, insisting that there is more to their daughters sickness than what meets the eyes. Speaking exclusively to our reporter, an associate of the former first family who pleaded anonymity because she was not authorized to speak on the matter said Uloma’s health condition has gone critical as Akpabio’s wife is only surviving by the grace and mercy of God. “Uloma Akpabio’s condition is critical as her vital organs have collapsed. Her kidney and liver have failed. Once these two vital organs stop functioning, its not something good as it is the kidney and liver that process even the drugs she should take but when they fail as they have it becomes useless to even administer drugs”. “Her issue is further compounded by the fact that her liver is also down. Doctors can try kidney transplant for her kidney but i am yet to hear of liver transplant. What makes her condition worse is that there is increased toxic in the blood resulting in mental disorientation and that’s the worst level of poison the body can take”, he declared. Reacting on the development, a former Commissioner who served during the first tenure of Akpabio said what is happening to Akpabio and his wife is a clear case of nemesis catching up with the former first family, submitting that the same may befall the Udom Emmanuel family if he fails to quickly disassociate himself from the atrocities of the Akpabio dynasty against Akwa Ibom people and ask for forgiveness from those he has offended. She insisted that though it is not African or cultural to rejoice at the misfortune of a person, the former first lady was privy to all the political motivated killings that were carried out in Akwa Ibom when her husband was in power which makes it practically impossible for most Akwa Ibom people to have empathy for her and accused Uloma of personally ordering the killings of some people especially women she believed were having an affair with her husband. “Many people were killed by Uloma than Akpabio. The difference was that those Akpabio killed were more pronounced but that of the wife were done with much more clinical efficiency and the Department of State Security played a very prominent role in this regards as rogue agents within the service were used by the former first lady to silence perceived opponents”, she declared. The former Commissioner noted with dismay that the crave for blood as a menu for power was so alarming during the Akpabio regime as many cabinet members who were not comfortable with what was going on within the government could not also resign and leave the regime for fear of being declared an enemy of the regime which would have qualified most of them to be marked for elimination by the “strike force” who for eight years were under the control and command of the former first lady. “While am not happy with what is happening to her, the truth is that people should use this to know that there is a God who sees and watches anything and everything we do. I am not trying to sound pessimistic but I do not see Akpabio’s wife surviving her present ordeal because of volume of innocent blood that cry out to God for vengeance for what her family did is much. Too many wives were made widows. Too many children were made orphans by the Akpabio’s. Too many husbands had their wives kidnapped, raped and killed and you don’t expect God to keep mute forever. Their blood, tears and lamentation constantly cry to Heaven daily and must constantly haunt those behind their untimely death and this is one simple truth the many religious men and women who were sycophantic around the former first family refused to tell them because of the blood money they were receiving”. She explained that the predicament of the former first lady should serve as a wake up call to leaders that one can still be in government and manage his or her political opponents without necessarily resorting to killing and assassination of perceived opponents and called on the present administration in the state to learn from what is happening to the Akpabio’s to avoid being a victim. “I will not pity Uloma as she deserves whatever comes her way and i can tell you that the fate of her husband will be worse once the EFCC concludes its investigation of the ongoing probe of his tenure as Governor. But my prayer is that Udom and the wife should quickly learn from what is happening and distance themselves and their administration from anything Akpabio, lest God’s anger will also be upon Udom and his household”. “Am not laying a curse on Udom but its a natural thing that will happen if he is not careful because a greater percentage of the deaths took place to pave the way for him to emerge as Governor. Personally, am alive today because of God as this same Uloma sent assassins to kill me that i was dating her husband. But God is my witness, her claim was not true and I became a Commissioner without knowing or meeting Akpabio before but based on recommendation some a high ranking chieftain of the PDP and Akpabio admired me because of his relationship with the one who recommended me to him for appointment as Commissioner but his wife took our closeness and relationship the wrong way. I left the cabinet because of her when it became obvious that my continued stay in the government will put my life and family at risk”, she submitted.